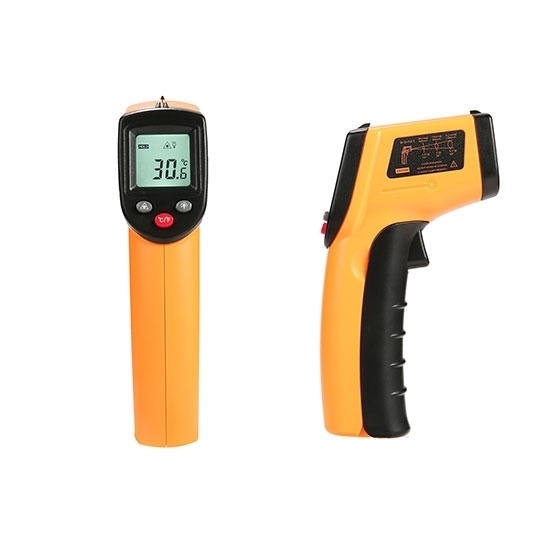 Cheap digital laser IR infrared thermometer/temperature gun provides accurate and fast measurements of surface temperature ranging from -50℃ to +380℃, +550℃, +700℃ or +900℃ with 12:1 distance to spot ratio; backlight LCD display, easy to read; compact size and light weight, easy to carry; wide applications with features of Celsius and Fahrenheit freely switch, data hold, auto power shut off etc. Digital IR infrared thermometers or temperature guns are widely used to measure the surface temperature of hot water pipes, hot engine parts, cooking surfaces, hot tubes & insulation, electrical connection and so on, a wide range of applications from home to industrial fields. Low price but high precision, easy to carry and use. 1. Infrared thermometer can only measure the surface temperature of the objects, yet it cannot measure the inner temperature. 2. Wavelengths above 5μm cannot be measured through quartz glass. The glass has special reflection and transmission characteristics, so the IR temperature reading would be not really accurate. However, temperature can be measured through the infrared window. Infrared thermometers are best not to measure the temperature of polished metal surfaces like stainless steel, aluminum, etc. 3. Position the hot spot. To find the hot spot, the IR thermometer first aims at the target, and then scans the target up and down until confirming the hot spot. 4. Pay attention to environmental conditions such as steam, dust, smoke and so on. It blocks the thermometer's optical system and affects the accuracy of temperature measurement. 5. Ambient temperature should also be taken into account. If the IR thermometer is suddenly exposed to the environment with an ambient temperature difference of 20°C or higher, the instrument shall be allowed to adjust to a new ambient temperature within 20 minutes. This video shows basic usages of handheld infrared thermometer and tells how easy and interesting to use the infrared thermometer. This temperature gun is really cool. Originally I bought this for my cooking. When receiving it, I use it to measure everything around the house - the window, the fridge, chairs, plants, etc. Also, my little dog really likes to play with it. A fun "toy"! Does this get the temperature of a kid’s fever? My dear friend, please don't do that. This infrared thermometer is not suitable for temperature measuring on people or animals. Great thermometer for what I need. Open the package, install the battery and turn it on. It is so easy to use. Just point at an object, pull the trigger and then get a temperature reading. Great thermometer for what I need.